"Does California Really Need Major Land Use and Transportation Changes to Meet Greenhouse Gas Emissions Targets?" by Tom Rubin — Orinda Watch Sign up! "California’s GHG emission targets, in and of themselves, provide little justification for efforts dramatically to change land use patterns or expand transit service. California’s metropolitan planning organizations should take note. Continued improvement in energy efficiency and emission reduction is important, but future plans should be based on proper technical information and analysis, not someone’s normative ideas about the way Americans should live, work and travel." "Crucially, however, ARB [(California Air Resources Board)] has not revised the 1990 GHG emissions figure upwards to reflect the new [Intergovernmental Panel on Climate Change (IPCC)] methodology. The effect of this is to increase the amount of GHG emission reduction required to meet the statutory target. " Orinda Watch Note: Ok. We're done folks; we've basically met our targets. So, why do we need to move people into high-density housing next to freeways? Aren't we just taking money that could be used to help people who most need it and giving it to developers? "...expanding transit—at least in the way currently envisaged by U.S. policymakers—is unlikely to deliver lower GHG emissions." Orinda Watch Note: so if that's true, why are we constantly told we need to expand mass transit? "It is also important to note that expanding transit may prove a very expensive—and far from cost-effective—way to reduce GHG emissions. For example, Moving Cooler, a report by Cambridge Systematics that advocated a “smart growth” approach to emissions reduction, indicated that its transit strategies would require expenditures of nearly $600 per ton of GHG removed in 2050. This is well above the $50 per ton of CO2 equivalent removed that the IPCC regards as the upper limit on acceptable costs for GHG emissions reductions." "According to the above schedule [Figure 1 of the article], the vast majority—almost 80%—of this [Greenhouse Gas Reduction between Plan Alternatives] is due to a reduction in GHG from transportation vehicles. Most of the rest [reduction in GHGs] is due to proposed changes to decrease LDV (light-duty vehicle) emissions that have nothing to do with land use." Orinda Watch Note: So, again, GHG reduction has nothing to do with land-use changes. But we have all been told that allowing people to buy a plot of land where it's least expensive so that people can build a home and property and life of their own is harmful. This suggests (in all but the most hyper-dense cities) that increasing density on a marginal basis actually doesn't contribute to GHG reduction. Maybe we should rethink the world view of telling people where they have to live? "Moreover, land use changes may be a very expensive way to reduce GHG emissions"..."expenditure per ton of GHG emissions reduction of $19,700—nearly 400 times the IPCC’s “upper limit” expenditure of $50." Orinda Watch Note: 400 times the upper limit for spending money on ways to reduce GHGs! Can't we find a cheaper way to reduce GHGs? WE SURE CAN! 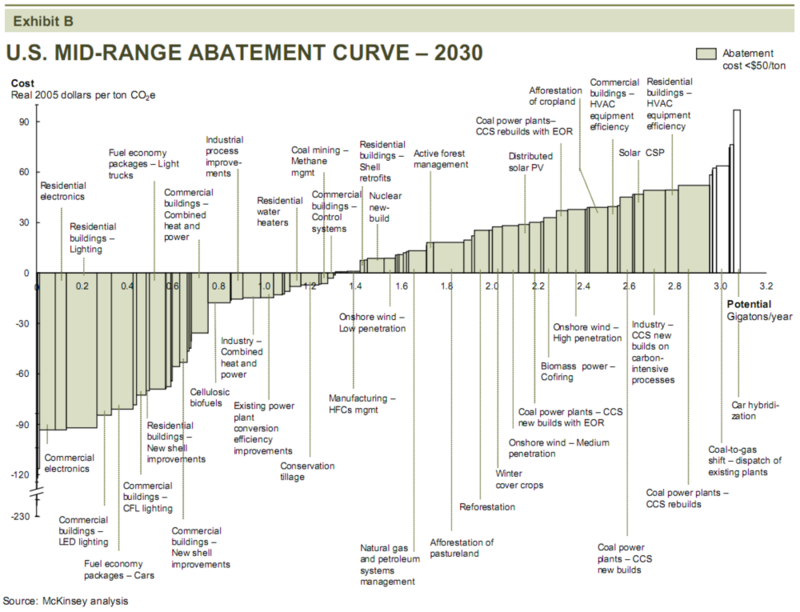 Check out this Abatement Cost Curve done by global consulting powerhouse McKinsey from 2009 which shows all of the cost effective (Read: less than $50/ton) ways to reduce GHGs (click on the chart below). The left-hand side of the graph shows the cheapest ways to reduce GHGs. Below the X axis actually creates net cost-savings to the end-user. Note that land-use changes don't appear anywhere on here because it is PROHIBITIVELY EXPENSIVE.